SOLDOTNA — After 42 years, the Alaska state record for a sport-caught pink salmon was broken — twice. Thomas Salas hauled a monster pink salmon out of the Kenai River near Big Eddy in Soldotna on Aug. 22. The California resident, who said he visits the Kenai every other year or so, was originally going to throw it back when a friend told him to hang on to it. “(He) said, ‘You gotta keep it, that might be a record,’” Salas said. As it turns out, he was right. When the anglers took the fish into the Alaska Department of Fish and Game office in Soldotna the next morning, it weighed in at 12 pounds and 13 ounces and 28.5 inches long, claiming the state record from the previous 12 pound and 9 ounce fish, caught in 1974. Multiple biologists certified it and sent Salas on his way, the new holder of the state record. About three hours later, Robert Dubar brought in his own humongous pink salmon. He’d pulled the monster out of the Kenai River just downstream of Angler’s Lodge in Sterling on Aug. 23. Dubar, who is visiting the Kenai Peninsula from Incline Village, Nev., brought the pink salmon into the Fish and Game office in early afternoon. The biologists there again took its weight and measurements and certified it — 13 pounds, 10.6 ounces, 32 inches long, the new state record. Dubar said he plans to mount the monster. Salas took the news with a laugh. Fish and Game certifies and seals particularly big fish caught by sport anglers through its trophy fish program. For pink salmon, the minimum weight to qualify is 8 pounds. Entries have to be weighed in the presence of witnesses and a trophy fish official on a certified scale. Catch-and-release fish can qualify for an honorary certificate as long as the angler doesn’t remove the fish from the water and someone gets a photo of it. Honorary certificates are measured by length. 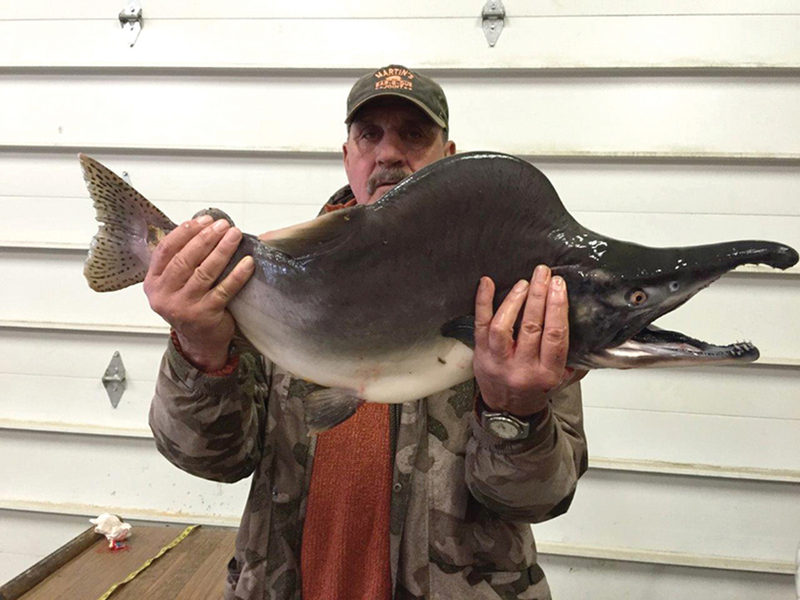 The previous record was held by Steven A. Lee for a 12 pound, 9 ounce pink salmon caught in the Moose River in 1974. Two other state trophy fish — a 16 pound sockeye salmon and a 97 pound, 4 ounce king salmon — were both caught on the Kenai River as well, both in the 1970s. Anglers have been catching enormous pink salmon in the Kenai River this season, said Jason Pawluk, the acting area management biologist for the Division of Sportfish in Soldotna. “I have lost track of how many pinks have been brought in this year for our trophy program, and that’s a pink over 8 pounds,” Pawluk said. The pink salmon have been consistently larger. Commercial fishermen began reporting early in the season that the pink salmon were larger, but the average has been consistently increasing throughout the season. The Kenai River experiences high even-year pink salmon runs, but these are some of the largest anglers have recalled seeing. The reason for the larger size isn’t really clear. Low pink salmon runs have been a mystery in Prince William Sound, Kodiak and Southeast Alaska this year — managers have suggested ocean temperatures as a possible cause. The pink salmon have been larger than usual in Kodiak as well. Pawluk said it’s still uncertain how large the run is, but the trend in larger size is clear. “It’s possible there’s still a record fish out there,” he said.